We knew that Most of Cisco 880 and 890 Series Models were End-of-Life and End-of-Sale. But there are still some popular models of Cisco 880 and 890 Series that are in use. Some of them were replaced by the other models that also belong to the Cisco 880 or 890 Series. 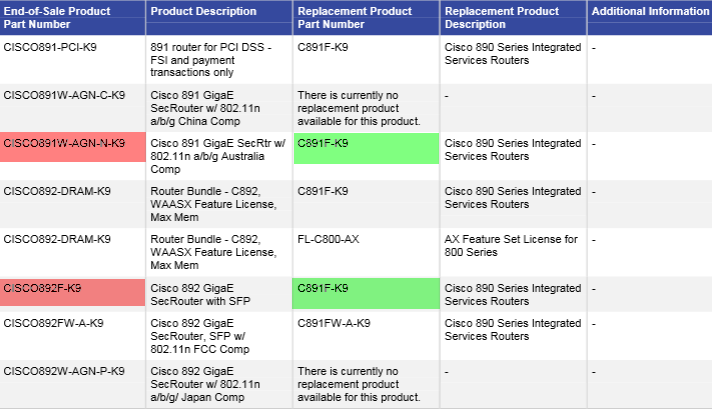 For example, you can read this Cisco 890 Product Part Numbers Affected by EoL and EoS Announcement. In this article, we will share the main information/data sheet of Cisco 890 Series updated in 2015. Cisco 890 Series ISRs come with an 8-port managed switch, providing LAN ports to connect multiple devices. An optional Power-over-Ethernet (PoE) capability can also supply power to IP phones and other devices. Eleven Cisco 890 Series models are available: the Cisco 892FSP. How the 890 ISR Addresses Edge Networking Challenges? In the following table it describes some of the business needs enterprises have in branch offices and other edge networking locations and how the 890 ISR fulfills those requirements. 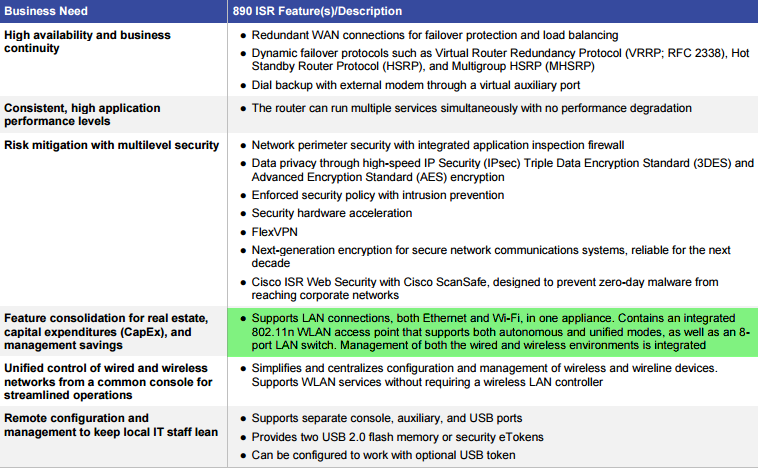 In the table below it describes the interfaces, Wi-Fi options, and integrated capabilities supported by each of the Cisco 890 Series ISR models. What is the difference between C89x, CISCO89x, and CISCO892F? The CISCO892F added an additional Small Form-Factor Pluggable (SFP) port on the router. This platform is based on the same platform as the standard CISCO890. The C890 Routers are a newer generation of the Cisco 890 Series ISRs, and they broaden the portfolio. These new C890 Routers also have a higher performance than the older CISCO890 Series Routers. Cisco 881, C881, the Same?